Declining in Kwazulu-Natal due to harvesting for medicinal purposes, its wetland habitat is being degraded by overgrazing and frequent fire. The decline across its range is insufficient for listing as NT. Western and Eastern Cape as far as Grahamstown and from Port St Johns to southern KwaZulu-Natal. An aquatic or semi-aquatic plant growing in marshy coastal areas, and along rivers. Victor, J.E. and Dold, A.P. 2003. 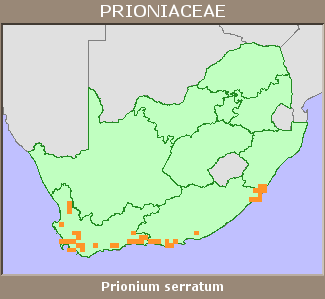 Threatened plants of the Albany Centre of Floristic Endemism, South Africa. South African Journal of Science 99:437-446.